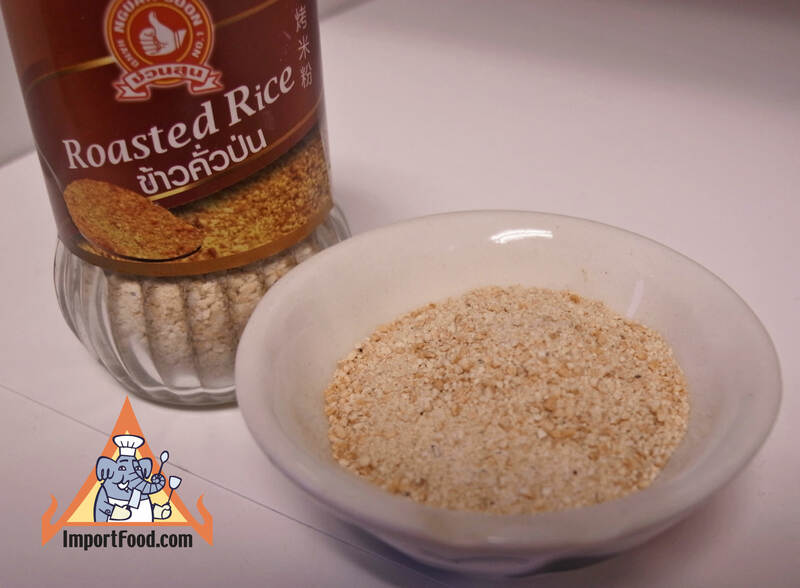 Roasted rice (khao koor in Thai language) is perhaps most famously used in Larb Gai (spicy ground chicken), a delicious dish served throughout Thailand and becoming very popular in Thai restaurants around the world. This simple ingredient adds a complex aroma, flavor and texture. It's just white rice, toasted in a dry wok (releasing a wonderful smoky aroma), then pounded in a mortar and pestle to create a mixed texture of fine and rough powder (see photo below). Used for generations in Thailand, khao koor soaks up the flavor of your dish and makes it slightly crunchy. Our khao koor is made to the highest specifications in the premium Hand Brand. Very convenient and made just the way it should be. How to Make Khao Koor at Home: get a medium sized wok or skillet fairly hot, and add a couple of tablespoons of uncooked jasmine rice. Keep in movement until the rice starts to turn golden brown. Remove from the heat and allow to cool. Grind to a fairly coarse powder in a spice mill, or a mortar and pestle. Don't grind it too fine--the powder should retain some "texture"). Packed in a nice glass jar, Hand Brand. Ingredients: Rice. All natural, no preservatives. 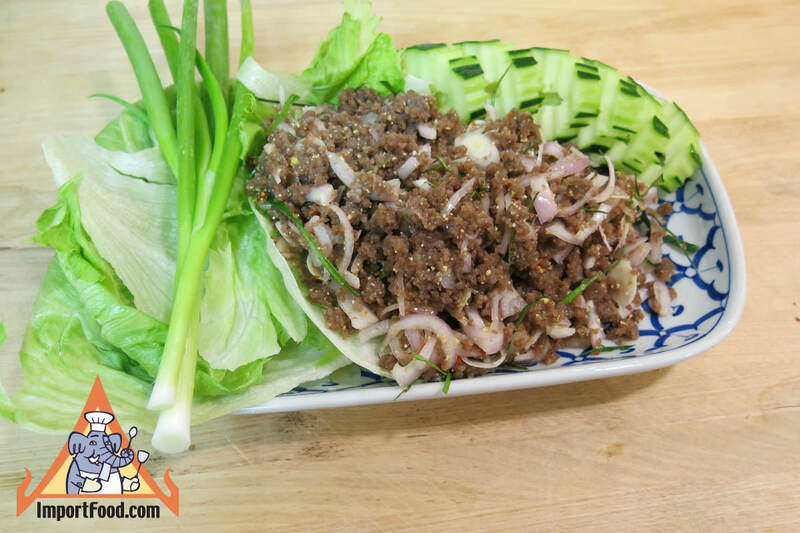 Also see links below to other versions of our larb recipes that use khao koor. 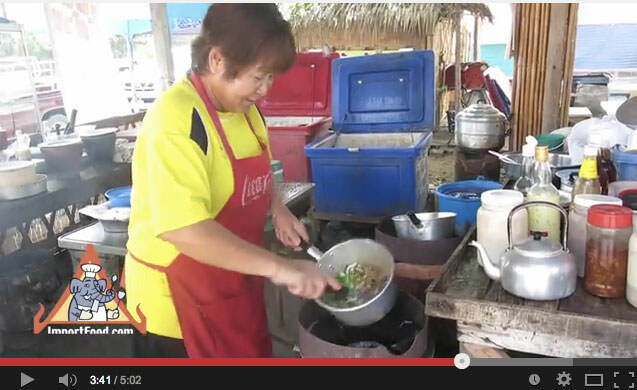 Also for your convenience, here is a link to our entire Thai Street Vendor Video Series. We love the flavor of flank steak, oddly one of the least expensive cuts. On a 900 lb black angus steer, you'll be lucky to get just two decent flank steaks, yet you can find this rare cut in good butcher shops for a price lower than more common steaks. Some people say flank is tougher, thus the lower price. 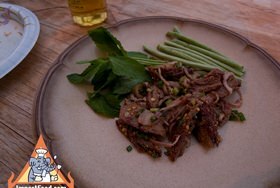 We think flank offers the most delicious flavor, and it's a perfect match for spicy Thai food. Flank is the perfect choice for the Tao Burner. We had fun cooking two flanks over just a dozen hot briquets. To get the best flavor, cook your meat over charcoal. Although we like flank steak best, there are other cuts that work great such as those with a thick ring of fat. As the fat drips onto your charcoal, you'll hear pops, and see fire rising up (this where the name crying tiger comes from). Thai restaurants around the world sell larb (also spelled laab) in various styles, usually with ground chicken "Larb Gai" or pork "Larb Moo". Our Lao version here, made with rare lean ground beef, is exceptional because the meat soaks/cooks in lime juice for several hours then finished briefly in a skillet to give it an especially sour flavor. Combined with the shallots, sliced lemongrass, fish sauce and ground chiles, it all comes together so well. It's very healthy too. You can make this same version with pork, chicken, shrimp or lobster. 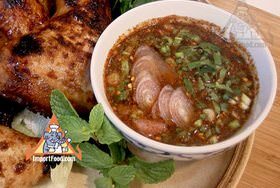 This is one of our all-time favorite Thai dishes, and it is a very common dish served throughout Thailand as well as Laos. It's quick to make and often extremely spicy, but the lime juice and mint leaves make for an exotic and splendid combination. It can be found on Thai restaurant menus in America as "chicken salad Thai style", which might be the best description for this dish. Larb is pronounced "lawb" and that means salad. 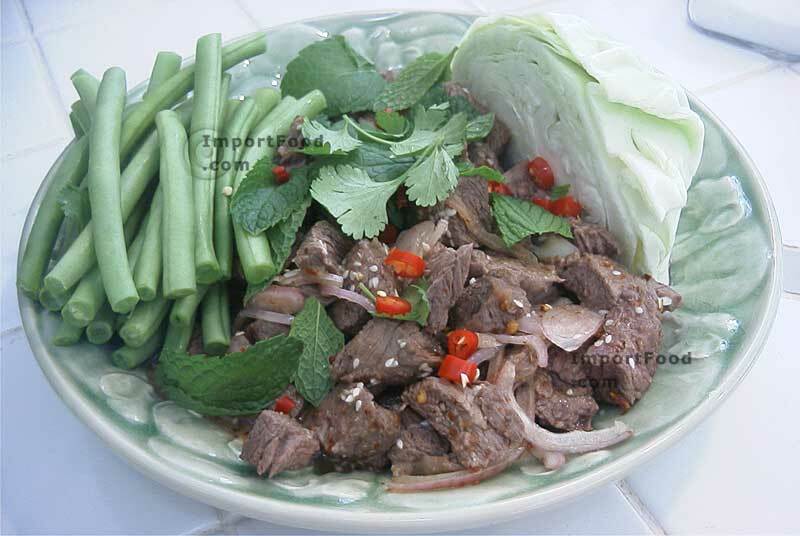 It can be made with beef (lawb nuea) or pork (lawb muu) instead of chicken. If you like spicy Thai food, chances are you will love larb. This is a really tasty summer salad especially if served over a bed of leafy greens together with fresh green beans. 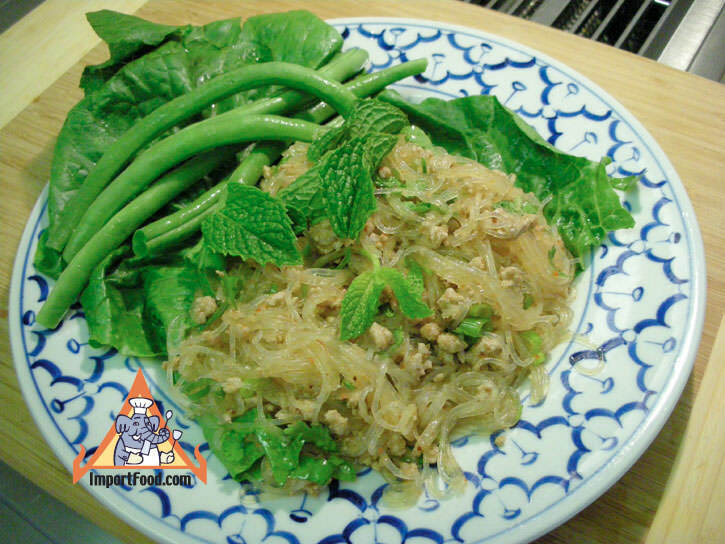 In Thai language, larb is in the category of salad. Often enjoyed with beer--ask an alcoholic in Thailand what food they like with a strong Thai lager beer, and they might mention larb. 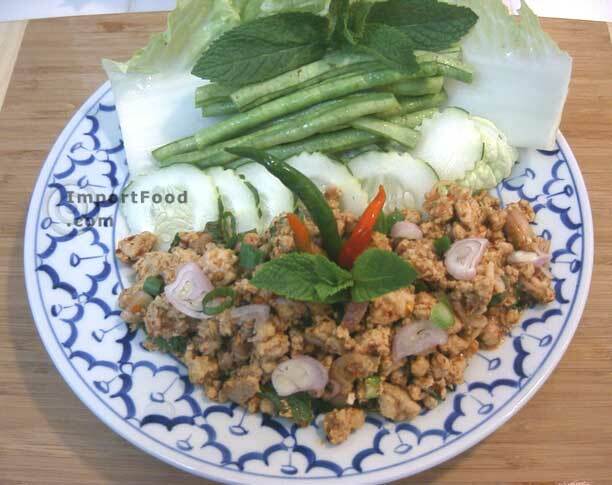 Perhaps the most common is larb gai (chicken) or pork. It's a one-dish meal or it can be served with rice. 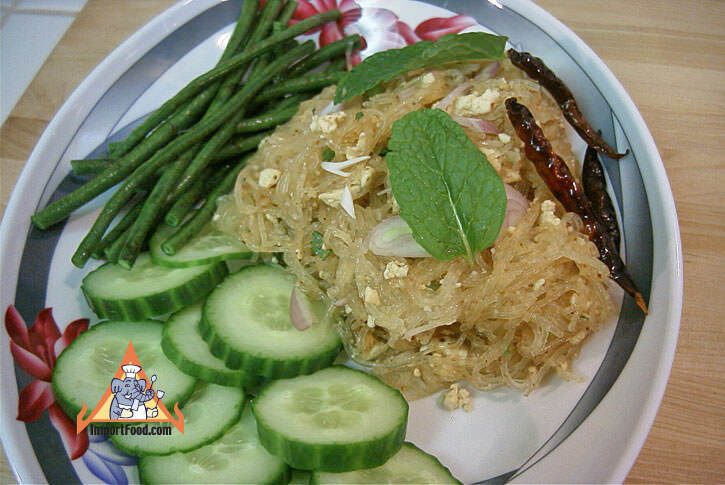 We like this version with beanthread noodles (also called glass noodles). Made from ground mungbean flour, these clear noodles soak up the flavor of the spices. We also have a recipe for vegetarian larb woonsen. New Recipe: Larb Woonsen in Spring Roll Wrapper. Nam Jim Jeaw is a popular sauce for grilled meat. We offer a packaged "E-San Sauce" (see below) which is the same thing, so now you can make it from scratch. The flavor is unique, smokey from the roasted rice, sweet, spicy and sour. Nam Jim Jeaw is delicious served with grilled pork, grilled fish, grilled chicken or bbq beef. Also goes well with Thai sticky rice. We now offer Namprik Thai Tae, a similar dipping sauce that you may equally enjoy. Fresh spring rolls made from all natural rice paper are a real treat, but rarely found in Thailand--it's more of a Vietnamese recipe. 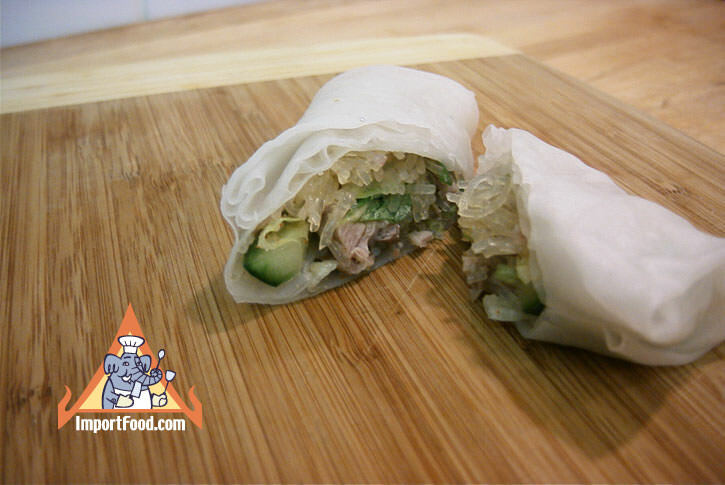 Rolling authentic Thai in a fresh spring roll wrapper is an innovation we came up with recently, and we know you'll love it if you like Thai food. There is no need for a dipping sauce, just follow the recipe and enjoy.